The gooseberry (Ribes uva-crispa L.) is a small berry that grows wild in the temperate climates of Europe, North America, and Siberia. Gooseberries are one among the most popular fruits in Great Britain, serving as a key ingredient in fruit desserts or meat sauces. Outside of their culinary uses, gooseberries are also well-loved for their great amounts of nutrients. Gooseberries are among the best sources of antioxidants. In addition to their abundance of phenolic phytochemicals, gooseberries also have plenty of vitamin C. A 100 g serving of fresh berries can provide 46 percent of the daily recommended intake of this essential vitamin. These helpful nutrients work together to scavenge free radicals from the body and boost the immune system against infectious agents. The high fiber content of gooseberries make them a reliable measure against numerous digestive ailments. By adding bulk to stool and keeping bowel movements regular, gooseberries can lower the chances of constipation and diarrhea. Fiber also assists in the production of gastric and digestive juices, meaning gooseberries are aid the entire digestive process. In addition to their laxative properties, gooseberries have a strong cooling effect that can alleviate the sensations of burning and discomfort associated with diarrhea. Gooseberries can reduce the likelihood of developing osteoporosis and arthritis thanks to their manganese. This mineral not only facilitates energy metabolism and blood sugar regulation, but it also promotes calcium absorption. Vitamin C is another nutrient that encourages positive calcium absorption, which cements gooseberries as one of the best fruits against debilitating bone diseases. The heart can also benefit from gooseberries. These berries can build up heart muscles, allowing blood to move smoothly through the body. Furthermore, the iron in gooseberries can keep the blood vessels and arteries clean, making heart attacks and strokes less likely to happen. Gooseberries that have been handpicked from the wild can be eaten on their own. Fresh gooseberries aren’t readily available all year-round in North America, however. The only time raw gooseberries can be bought is during a short time during the summer. Fortunately, canned gooseberries are a decent alternative to fresh gooseberries since they have the same nutritional value. Depending on the flavor of the gooseberries, they can be prepared and eaten in any number of ways. Tart and sharp gooseberries can be turned into jams, jellies, or chutneys, or used to make the sauces of fish, poultry, and meat dishes. Sweet gooseberries are an ideal addition to salads, muffins, and ice creams. Gooseberries are a great source of crucial antioxidants. The fruit can be used to alleviate symptoms of various digestive ailments. 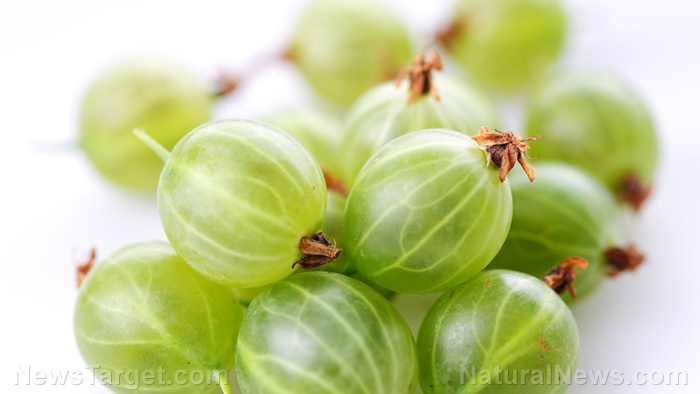 Gooseberries can reduce the risk of osteoporosis and arthritis.